Just finished the movie "He Never Died" starring Henry Rollins. If you haven't watched it, it's classified as "horror" but is really more of a violent psychological drama, with a bit of investigation thrown in, and definite supernatural themes. The figure in the movie who might best be described as the iconic horror role, is actually the figure you get to know best in the film. If that's triggered your interest, go find it. If that's set off alarm bells and trigger warnings, just leave it alone. It's nice to be considered the "go to guy" for gaming support with regard to the Australian Indigenous community. If I had strung together my discussions with community members, my study at university, and my general work with local elders it would be a few solid weeks of immersion over the course of the last year. I don't think I'm an expert on the subject matter, I barely think I'm scratching the surface, I'd love to see an actual member of the Indigenous community writing games, but it seems that I'm the "go to guy" for the moment. That means I've basically got an obligation to make sure Walkabout is finalised in the next couple of months... and to make sure the product released is as good as I can make it in order to start a dialogue with potential Indigenous game designers who are looking to tell their own stories. 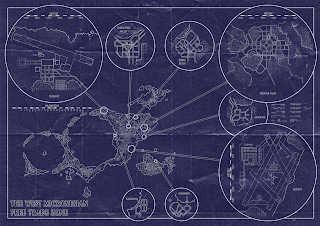 This mapping commission consists of three maps. One for the base camp, one for the overland trek, and one for a mountain to climb and explore at the end. I've already shown the map for the overland trek. 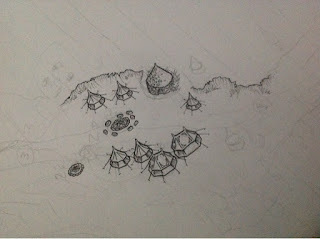 The details of the base camp were based as a loose interpretation of this map. The tricky bit has been the mountain. The general idea is that the characters will explore an ancient legendary mountain that has settled around the remains of a petrified dragon. 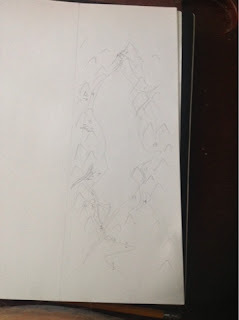 I thought it might be interesting to depict the mountain as a cross section, depicting the dragon writhing in the centre of the mountain. Other ideas just didn't look suitably mountainous, or suitably draconic. Pencil sketches were sumbitted to the client. ...followed by shading of the rock inside the mountain. Here I deliberately used multiple thicknesses of pen to emphasise the shapes of the petrified dragon, as compred to the other stone comprising the terrain. ...some are just a bit more obvious about it than others. I've been watching the development of some new (and not so new) roleplaying ideas by several people. There seems to be a common thread in many people's designs where the heroes develop by gaining new abilities and improving those abilities, actually this has been a common thing in pretty much evey roleplaying game except for those designed as one-shots or those that are going out of their way to push the envelope in some way. After watching this year's Doctor Who Christmas Special, I'm reminded of one of the things that Doctor Who can do really well... Especially compared to a lot of other TV shows and narrative forms where time travel is an element. Don't get me wrong, Doctor Who has just as many failures when it comes to temporal narrative, but it's been going for so long that there have been some great examples of how storylines and timelines can combine, compliment and even contradict. It basically reflects the way I run long term narrative in a campaign. Each episode has a few hooks, some of which get resolved, usually enough to get a feel of closure when the episode concludes, but sometimes not enough and people complain about plot holes. Usually there are one or two plot points that just don't get resolved, but in a show like Doctor Who they can be resolved in a later episode or even a later season. I recently finished my university degree, a Bachelor of Arts focusing on Social Analysis and Sociolinguistics. The final stage of that included research into play, particularly focusing on the cosplay community, but touching on elements of LARP. One of the things I found was that there really isn't a lot of research work being done into the field of adult play. There is a bit coming from the Nordic scene, but most play research is focused on the elements of children's play and the realm of computer gaming. But there is a lot of adult play going on. I'm writing this post as a call out to anyone who reads the blog, and who might know of some academic papers, journal articles, or other sources, that discuss adult play. I've been thinking of doing some serious research work in this field for a few weeks, and there seems to be a drive in the local community (at least partially driven by +Keiran Sparksman) to get some more formal work done in this sphere. I have been commissioned to illustrate a series of maps for a new Torchbearer product. Given that Torchbearer is one of those indie games that seems to be getting a bit of traction lately, it's great to be considered for this opportunity. I'm guessing +Dyson Logos was busy. I'm working on rebuilding the Elgardt LARP system, incrementally. The problem is that there are other parties who are also integrating changes into the game. One of my aims when designing a freeform LARP is to give everybody too many things to do during the course of play. 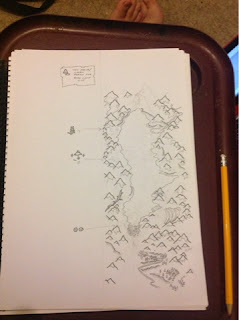 I like to set up webs of intrigue between players, and give them jobs to do that force them into interaction with other players, while the other parties interested in developing the game further have pushed toward micromanaged quests with small groups led by GMs through railroaded scenarios. The problem I see with that second option is that when you only have one or two GMs for twenty or more players, you can micro-manage four or five (maybe even six or seven) each but everyone else is stuck waiting for their turn to go on a quest later, or maybe they get relegated into the role of NPCs. I've been digging through the archives of the unnamed "pirate/steampunk" boffer LARP system I developed last year, and with over a year of regular experience playing this style of game through Clans of Elgardt (CoE), most of my thoughts real haven't changed much. There are a few things that I'd change slightly based on my "experience in the field", and far more things that I'd change about CoE to get a happy medium. There's a certain naivety about the game, but that's to be expected since the original designers had never written a game like this before and generally worked from second hand accounts about what games like this could be. I'd love the rewrite that game from the ground up, because it has some interesting concepts in it, but now has too much baggage and too many other people trying to rewrite things about it (even to the point that one of our local spin-offs is basically a CoE heartbreaker). The last time I developed a Boffer LARP system, I began with a set of Positives and Negatives... or, more accurately a continuum of Positive non-negotiables, positive negotiables, negate negotiables, and negative non-negotiables... basically the continuum goes from the ramge pf thins to definitely be a part of the game, through those I'm less opinionated about, and on to those I definitely don't want in the game. I think the main difference in this new system is that magic moves from a non-negotiable positive to a negotiable. Post apocalypse isn't really known for magic, but occasionally psychic powers or mutations appear in the fiction. I'll probably be looking at the last series of LARP design posts pretty closely as I develop "Can of Beans", reflecting on those ideas in light of the play experiences I've had in the last 15 months since I wrote those posts.